SOCIAL media this week exposed a cross border diamond scandal that is threatening to tarnish the diamond reputation of Namibia involving well placed politicians, social and business personalities. At the centre of the exposé is the 29-year-old Mwahafar Iyambo Markku Ndilula, the son of former diplomat Kakena Nangula and businessman Mwahafar Ndakolute Ndilula and 25-year-old New York-based Harvard graduate lawyer from Namibia currently working for the United Nations (UN), Fillemon Shikomba. 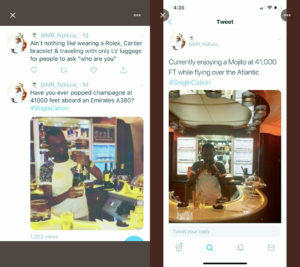 Numerous bragging posts taken and posted online from aboard the Emirates business class showing Mwahafar Jr popping champagne sparked the scandal that has since led to threats of legal action and a firestorm on social media revealing what can only be described a daring diamond dealing escapade. According to information in Informanté’s possession, Shikomba this year approached Mwahafar Jr to help him find certified local diamond dealers after the African and USA-based African Minerals Resources Exchange (AMRE) expressed interest in seeking partnership and sales routs for diamonds from Namibia. In the letter expressing sales interest, dated 27 September, 2018, and signed by Frank Weston, President of AMRE and UN-affiliated International Multiracial Shared Cultural Organisation (IMSCO), to advance success, interested partners would be required to provide manifests for polished and raw diamonds to begin operations and send an assortment of fine cut and polished and raw gemstones available, amongst other requirements. According to Shikomba, Mwahafar Jr bragged that his father owns a diamond company and that his cousin, Kennedy Hamutenya, is the CEO of NamDia – giving seeming legitimacy to a partnership that last week ended with egg on the faces of the diamond partners in New York. 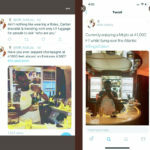 In the weeks leading up his travel to the USA, Mwahafar Jr tried to convince the partners in New York that he is a legitimate representative of certified diamond dealers in Southern Africa by sending pictures and videos, supposedly taken by himself, of stones being prepared for a manifest. He informed his diamond partners that he would be carrying diamonds worth N$67 million into the US. The videos and pictures in Informanté’s possession were taken against latest local newspapers and sheets of paper with hand written dates to show that the transaction is current and legitimate. At the time of going to print, it was not clear how Mwahafar Jr had obtained the videos and pictures with authentic stones as he preferred to remain tight lipped. “Engagements of this nature are naturally confidential. As such, I’m not at liberty to reveal exact details except to state that I had obtained several mandates and manifests as per the agreement and requests made by IMSCO. It’s also important to note, that the diamonds included in this parcel were not Namibian in origin but from two other countries within the SADC region,” Mwahafar Jr told Informanté yesterday. The American partners, satisfied that they were dealing with a legitimate diamond middleman, on 26 November, 2018, wrote an invitation letter for the purpose of obtaining a US-visa to Mwahafar Jr, in which they claimed that he was invited to participate in the United Nations IMSCO African Diaspora capacity Building Workshop to Launch the best UN aims on Human right watch, to take place on 4 December 2018 in New York. The partners also forked out close to U$320 (about N$4,500) for Mwahafar Jr to obtain his US visa and an alleged permit to transport the diamonds into the US, as well as a business class return ticket to New York via Dubai at a cost of U$5,200 (about N$73,300). The morning before flying out of Windhoek, however, the New York partners asked Mwahafar Jr to send pictures of the parcel to satisfy themselves. Mwahafar allegedly first informed them that his business partner was taking the parcel to the airport through a security agency for safety, and once at the airport informed them that while he had the parcel on him, he could not take pictures because there were people around and it could compromise him. Once he landed in Dubai, Mwahafar allegedly told his partners that the parcel had been confiscated at customs but that he would get it back after airport officials had satisfied themselves with the documents he had provided to them to show that he had authority to transport the diamonds cross Atlantic. Meanwhile, back in the States, the most prominent certified diamond dealers in the world had jetted into New York in anticipation for Mwahafar’s arrival with diamonds worth millions of dollars. Mwahafar landed in New York on Wednesday, 5 December, without the diamonds, but assured the partners who met him at the airport, including Weston, that the diamonds would be arriving the following day once Dubai customs had done all necessary verification’s. The partners, however, learned the following day that Mwahafar never had diamonds on him, forcing them to pay a rebooking fee of U$400 to get him on the next flight back home after convincing him to write a confession letter. In the signed confession letter dated 6 December, Mwahafar admitted that he lied about traveling with the parcel from Namibia and informing them that it was detained in Dubai due to misunderstandings at customs. The confession letter was allegedly shown to the various diamond dealers who had spent money traveling to New York under the pretext of diamond trading to prove that the diamond sales couldn’t take place as IMSCO had been duped by a young Namibian. Shikomba, on his part, claims that he reimbursed the partners the travelling expenses to keep them from taking criminal action against Mwahafar. “Frank and Jeff (Vice President) wanted to write to the Namibian mission in Washington to deport him, but I know my work at the UN and the work I do back home would be compromised if a fellow Namibian was detained in the US under my watch, and so I took it upon myself to pay back the money spent on his flights and we put him on the next flight back home because I no longer wanted him in my space knowing what he had done,” said Shikomba. Shikomba claims that he decided to expose Mwahafar Jr on Twitter because he later learned that Mwahafar Jr had been scamming people for a long time and always gets away with his crimes. “I put it out there so that other people can know that he is a scammer. I’ve since been in talks with his mother who, apart from thanking me for taking mercy on her son, also offered to try and pay back the money through loans as she is a pensioner. I told her that it was not necessary and that I just wanted him to change his ways,” said Shikomba. The press statement that IMSCO promised to issue following the firestorm that implicated the organization on social media was not available at the time of going to print.